DOWNTOWN BROOKLYN – Two new public schools are coming to downtown Brooklyn at no cost to the city. The schools come as part of Alloy Development’s 80 Flatbush project which will include affordable and market-rate residential units, office and commercial space, and a cultural facility in its two towers – 74 stories and 38 stories high. Alloy and the Educational Construction Fund (ECF) presented plans for the schools (see the whole presentation) at a September 28 meeting held at PS 261. “ECF and Alloy have been and remain committed to extensive community outreach on the project,” AJ Pires, President of Alloy Development, told BKLYNER. “To date, we’ve held more than 70 meetings with local stakeholders. The CEC15 is an important stakeholder, as the project includes two new public schools. This was our third meeting with them to date,” he explained. “We need to address the overcrowding issue in a planned and deliberate manner and not do it in a piecemeal approach,” Carrier said. It is not very common for the city not to build its own schools. Only 15 schools have been built through the NYC Educational Construction Fund, a public benefit corporation, which builds new public schools as part of mixed-use developments without using capital funding from the NYC Department of Education (DOE) since it was established in 1967. Currently ECF is working on two projects with the DOE – 80 Flatbush in Brooklyn and the School of Cooperative Technical Education (Coop Tech) on East 96th Street in Manhattan. 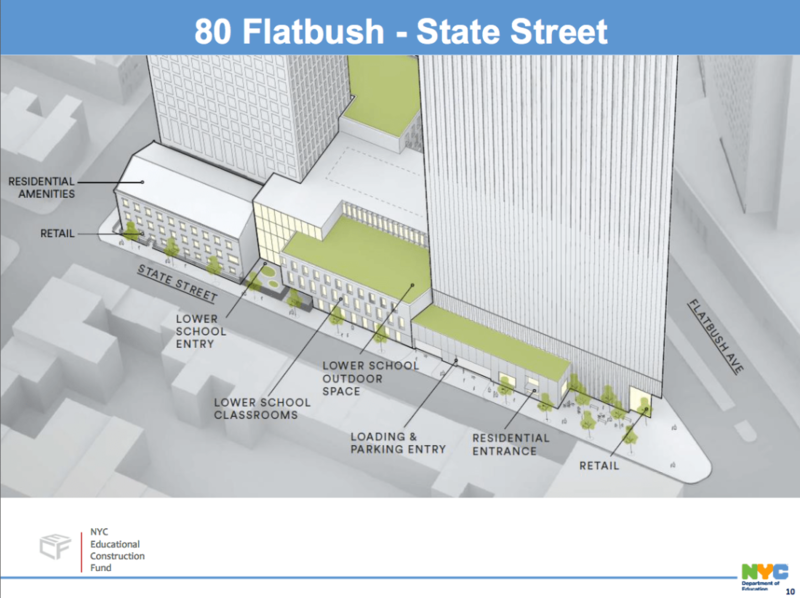 One of the new schools planned for 80 Flatbush will replace Khalil Gibran International Academy High School, currently located in an outdated building at 362 Schermerhorn Street. Robert Perris, District Manager of Community Board 2, said Khalil Gibran is housed in an old civil war era building that lacks a gym and bathrooms on some floors. The new school will increase Khalil Gibran’s capacity from 275 to 350 students and add a gymnasium, cafeteria, and library to the new facility. The second school planned for the site will be a new 350-seat elementary school. Pires said the project is different from other projects that have a negative impact on the community. “We’ve been closely listening to all stakeholder feedback and believe community engagement only makes the project better,” he said. “That feedback has already shaped the project in many important ways and will continue to do so as the process moves forward. We ultimately believe the public benefits from the project which brings two new schools, 200 units of permanently affordable housing, a new cultural facility, thousands of new jobs,” adding that the project would “constitute significant wins” for the community and Brooklyn overall. However, Carrier said the city doesn’t need Alloy to create or fix schools. He said that SCA has the money to do that on their own. The SCA is in charge of building new public schools and maintaining and upgrading existing schools with the city’s capital fund. The SCA website shows that the agency currently has a five-year capital plan of over $14 billion for NYC schools. However, based on the Department of Education’s June 2017 Draft Environmental Impact Scope presentation for 80 Flatbush, SCA will not fund 912 of the 2,192 seats needed for downtown Brooklyn. Some residents believe the development is far too large for the area which currently consists of residential brownstones (State Street and 3rd Avenue), and are opposed to proposed changes to rezone the block which would allow for the outsized development. Kollins said that the 900 residential units created may add to the current school seat deficit. He added that the city should build its own schools without private developers. The current proposal will not alleviate, but likely exacerbate, both the current student overcrowding issue and the school equity issue in District 15. ECF’s project utilizes an outdated formula to determine primary school seats and doesn’t weigh middle school impact. 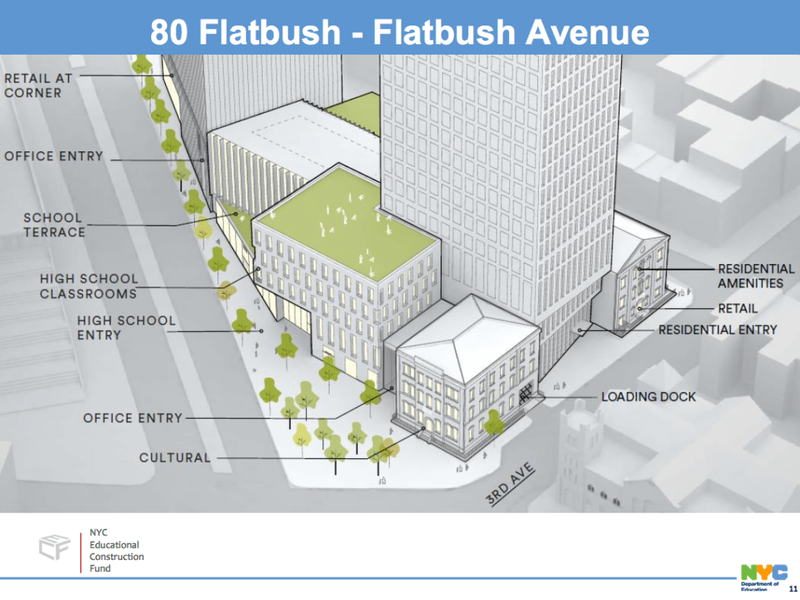 The project’s completion date of 2021 increases the likelihood that this multiplier will be more inadequate and the likelihood that all the new primary school seats at 80 Flatbush will be used by the residents of the development. Though the project designates some affordable units, given current zoning tendencies, creating a school utilized primarily by one block of residents exacerbates the equity issue CEC 15 is committed to solve. CEC 15 proposes ECF and Alloy provide 750 to 1,000 primary school seats to truly address district overcrowding and integration. CEC 15 encourages ECF and NYC School Construction Authority to renovate Khalil Gibran International Academy and utilize the remaining property at the site to materially increase the number of seats available to all children in District 15, fully accounting for the increased demand anticipated from all area residential development. The current proposal fails to do that.